As cryptocurrencies compete for the most efficient technology in the digital atmosphere, one cryptocurrency has maintained exponential growth and expansion unlike others; the TRON foundation, represented by the underlying cryptocurrency ‘Tronix’ (TRX). Buying Tronix, referred to as ‘buying Tron’ for short, enables you to partake in the various applications available within the Tron ecosystem, send and receive digital currency that is confirmed in very short intervals, and partake in an economy that is entirely digital. Buying Tron can be a complex process, especially for beginners in blockchain and cryptocurrency, and as a result, this guide will walk you through the easiest, most cost-efficient ways of buying Tron. Tron is a cryptocurrency, similar to Bitcoin or Ethereum, you have to purchase it first before it can be used as a currency or for any of its other main purposes. Buying Tron requires a formal payment method (Credit card, bank account transfer, or another alternative) and a secure internet connection. In this guide, we’ll guide you on how to purchase Tron, teach you more about using Tron, and what exactly this enticing cryptocurrency is and what it’s capable of. Link a valid deposit method (Bank account, credit card, or PayPal) and fund your account; we recommend a minimum of $250. Click on ‘Trade’ and specify how much you’d like to purchase worth of Tron. 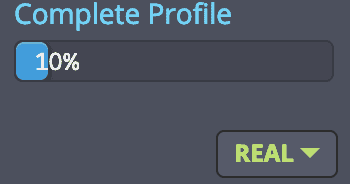 Click ‘Submit’ and on the next confirmation and completion of processing, you’ll now be able to see that your Tron balance has been updated. Cryptocurrencies like Tron are relatively new technologies, however, there are multiple exchanges that offer direct PayPal integration to make the process of buying cryptocurrencies easier and to an extent safer (Meaning you don’t have to enter sensitive information on additional exchanges, rather just link one PayPal account). These supported exchanges can be found here. Tron is an overall foundation, a blockchain that promotes a decentralized and entirely digitized internet that is fueled by its underlying cryptocurrency ‘Tronix’ (Represented on exchanges and markets by the ticker symbol $TRX). This might be confusing at first, so let’s separate the two main entities involved: Tron is the blockchain as well as the company behind the Tronix cryptocurrency. Sometimes, however, Tronix the cryptocurrency is referred to simply as Tron for short. In any case, Tron as a cryptocurrency is like Bitcoin or Ethereum, in that it is a currency that runs virtually on a blockchain in an immutable form. The Tron blockchain is different from Bitcoin and Ethereum, however, in that it can process thousands times more transactions per second than Bitcoin or Ethereum. This has been arguably at the cost of a bit more centralized internal system than other blockchains such as Bitcoin, where an even further level of decnetralization is incurred, however, Tron has become a valid contender for the top cryptocurrency spot in its ability to process thousands of transactions per second. Tronix can as a result be sent, received, and confirmed within just a finite amount of time. Tron, similarly to Ethereum, enables developers to build decentralized applications (Known as DApps) on the Tron blockchain and offers incentives for those looking to develop on the blockchain. This means there are applications such as games, betting arenas, and even investment applications that are built on the Tron blockchain that combine the efficiency and protocol of Tron with the usability of the internet’s applications. These decentralized applications, while built on the Tron blocchain, are powered by Tronix (TRX) and are used as the fuel for these apps. When they are deployed or ineracted with, Tronix is being used. Tron’s ecosystem enables immutability through online applications while emphasizing a thorough platform for people to develop and work with. Creating a Tron wallet is easy and can be done through a variety of different verified sources. If you’re looking to create a basic preliminary Tron wallet to just send and receive Tron, you can do so by navigating to Tron’s official wallet page which can be found here. The wallets in this link have all been vetted and confirmed as legitimate by Tron beforehand, so this allows you to use the wallets with more confidence than if you were to use a more unverified or lesser known wallet with an unknown developer. Additionally, if you want to utilize Tron DApps (Which are decentralized applications that we spoke about that enable you to move through the markets and play games, lottery bases, and much more, then you’ll need to create a TronLink or equivalent type wallet. These wallets are used as web browser extensions (Primarily with Google Chrome) and can be found for download here. (Step by Step) How to buy Tron on eToro? eToro has recently enabled the purchasing and selling of Tron which is a very big step for both the exchange as well as Tron. Tron was not, until eToro, traded on a large number of regulated and financially registered exchanges. eToro is an FCA regulated and CySEC (Cyprus Securities Exchange Commission) registered firm that offers the purchase and sale of a plethora of different assets and currencies including equities CFDs, and now cryptocurrencies. It’s a great option for buying TRON because the firm maintains high regulation andd security and at the same time offers easy retail-level deposit and funding methods such as PayPal integration, bank account transfers, and even credit cards. Getting started with buying Tron on eToro is fairly quick nad won’t require a lot of time. Make sure beforehand that you have a valid form of funding to use (Such as PayPal or another method such as. credit card/bank transfer), avalid internet connection, documentation to use for account verification, and a reliable internet connection (Since we’ll be dealing with sensitive information, having reliable internet is very important). Upon clicking the button, you’ll then be asked to enter in your email as well as a secure password. Make sure this password is secure and that you don’t share it with anyone; eToro is a financial service provider, so your account login details are very sensitive. Things such as your bank account, PayPal, and other information will be stored on the site, so be wary. Once you’ve entered in the information as required above, go to the email you entered and you should see the email that asks you to click the verification link in order to move forward with the account opening process. 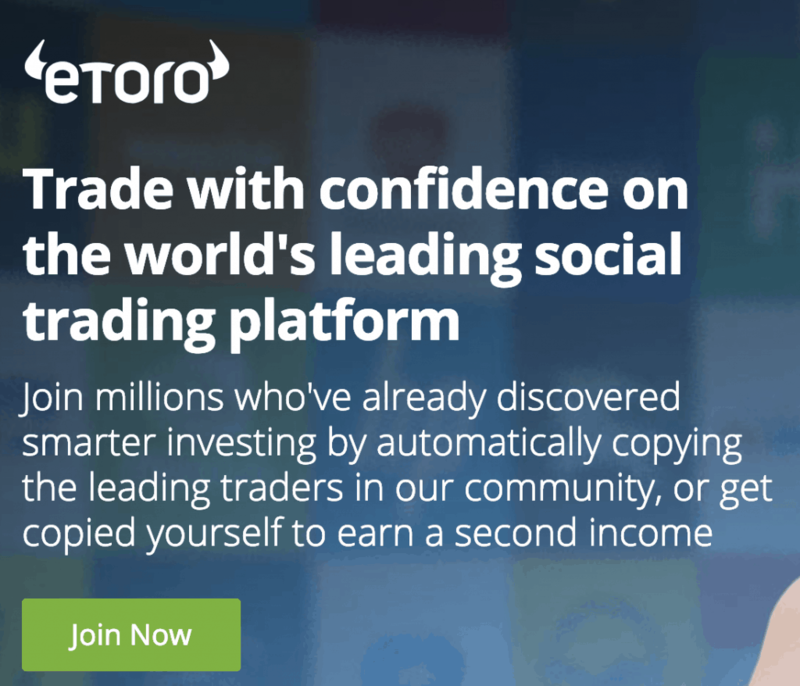 Click this, and you’ll now have a preliminary eToro account ready to use. 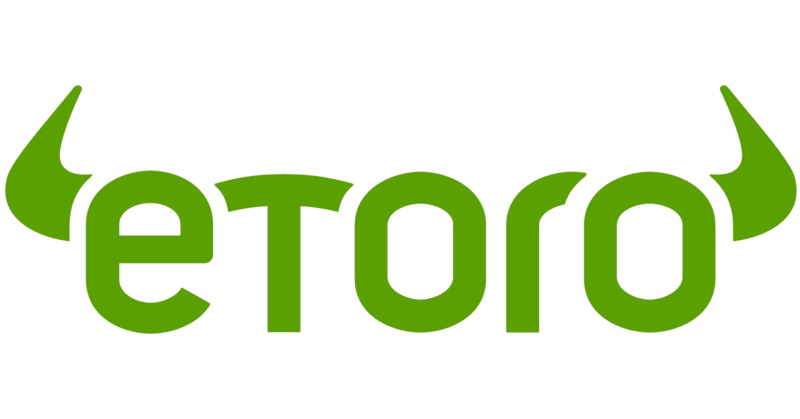 eToro is a regulated and registered exchange which means you will need to submit the appropriate documents for them to review and confirm your investor profile on the site. This might seem tedious at first, but it will give you insurance on your funds and enable you to have a higher level of security when purchasing your Tron. Although cryptocurrency purchases on eToro are not insured or overseen by the FCA, the trading of eToro’s CFDs on the site are. This means to enable this protection, you need a valid and verified account. In order to verify our account, we’re going to need to submit the proper documentation to the eToro team. To do this, login to your preliminary eToro account, and go to your account homepage. On the left-hand side you should see your email as well as the percentage completion of your account. In this example, we haven’t submitted any documentation yet, so our account is. only validated at its most finite level. Providing these documents will then send your investor profile application to eToro for review. If successful, after a few days, you’ll have a verified account that’s ready to begin purchasing and selling different assets such as Tron. To purchase Tron, you’ll need to deposit a certain amount of funds to move forward. There’s a range of different options you can choose from as far as deposit methods on eToro, so let’s get started. To begin, go to your account profile and on. the left-hand side you’ll see the drop down with all your menu options. 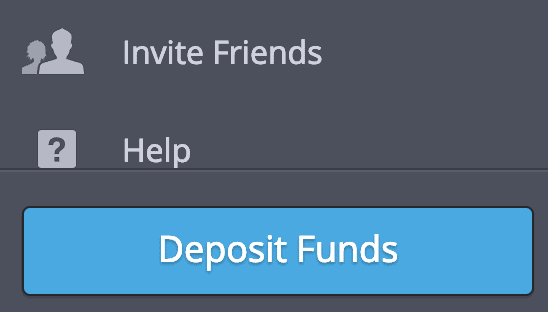 At the bottom, select the button that is blue that says ‘Deposit Funds’, as indicated in the following image. This will lead you to a new page where you’ll need to indicate how much you’d want to deposit as well as which funding method you’d like to link. PayPal is one of the easiest options, so select PayPal (Or any funding method of your choice) from the drop down and then proceed to link the account or method to the site. This will ask you for a quantity and then on the following page, you’ll simply be asked to confirm your login and confirm the details of the transaction you’re initiating. Once completed, allow the funds to process, and after confirmations, you should then be able to make the purchase for Tron. By selecting the ‘1x Margin’ button you’re imposing no margin and allowing for a purchase of the underlying asset as opposed to trading the CFD for Tron. If you’d like rather to trade the CFD of tron select the ‘1x Margin’ button and change it to ‘2x Margin’. This will accrue fees, however. In any other case, enter in the quantity you’d like to purchase worth of Tron, and press the submit button. Upon execution, you’ll have successfully bought Tron on eToro. Binance is an exchanged owned by Changpeng ‘CZ’ Zhao that operates in Malta; it has become one of the more reputable exchanges to purchase Tron on, and it allows you to do so with credit card or with a base cryptocurrency such as Bitcoin. Buying Tron on Binance is convenient and fast and doesn’t require too much work due to the fact that the platform streamlines the process for you. You also don’t need to verify or validate your account for purchase of Tron, so it’s a fast option. Prior to getting started, ensure you have a valid form of deposit (Credit Card or cryptocurrency) and also have a working accessible email address. From here, enter in a valid email address, as well as a secure password. Don’t share this password with anyone else, because the access to this account will yield access to your funds. Click submit, and you’ll then be asked to confirm the email address by clicking the link in the email that the exchange has sent you. This will verify your account. The next step to buy Tron on Binance is depositing and acquiring a cryptocurrency that is paired to Tron so we can exchange it for TRX. This can be either Bitcoin, Ethereum, Tether, and more (These are the best, easiest ones, especially for beginners. Depositing on Binance can be done in 2 main ways; directly sending cryptocurrency to your unique Binance wallet, or by purchasing a base cryptocurrency that is paired to Tron using a credit card. Using a credit card on Binance is easy and straight forward. To get started, sign in to your account and on the navigation bar and the on the right-hand side click on ‘Funds’ then and from the drop-down select ‘Buy with Credit Card’. Specify how much you want to purchase and press ‘Buy Now’. Bitcoin will then be deposited to your Binance account after the payment is processed. Let’s go over the alternative way for deposit prior to advancing to the next step. If you already own Bitcoin from an alternative source, you can deposit it to Binance immediately and use it to purchase Tron; the process is fairly simple, and in this case you don’t need any credit card. 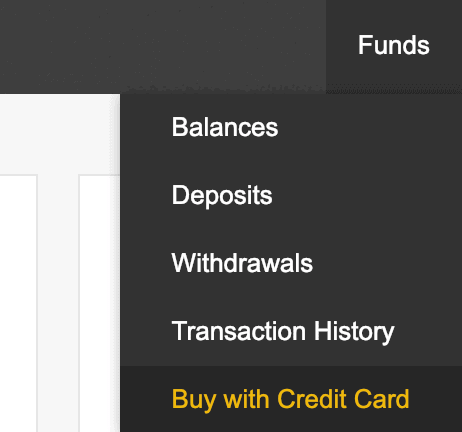 If you already have prepurchased Bitcoin and want to purchase Tron, head over to your account navigation bar on Binance and hover over ‘Funds’, then from the dropdown menu select ‘Deposits’. A new page will appear and there will be a list of different cryptocurrencies for deposit and withdrawal. Use the magnifying glass found on the same page and find ‘Bitcoin’ Click on the ‘Deposit’ button located to the right of the listing. 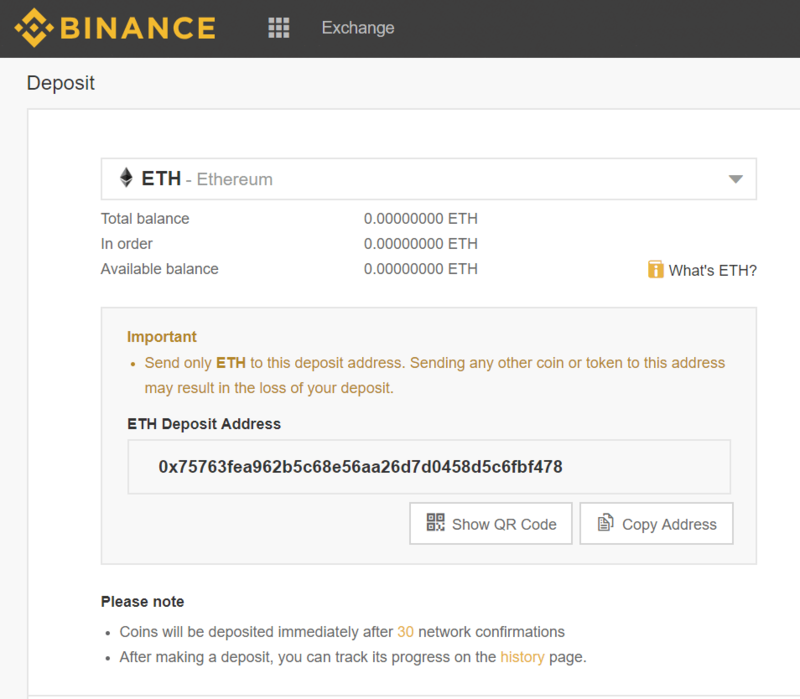 The following image shows you where the deposit address for your Binance created wallet will be located. This will be a string of letters and numbers, and it will look like gibberish to you; that’s because it is, so don’t be worried. Press ‘Copy Address’ as indicated below, then navigate to where you’re currently holding your Bitcoin (Either another exchange, your own internal wallet, a hardware wallet, etc). On your external wallet, or wherever you’re currently holding go to the ‘Send’ section. 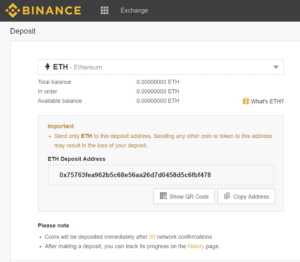 The interface will ask you to paste the wallet address that you copied over from Binance. Enter in the input field, specify how much Bitcoin you want to send, and press ‘Send’. After the appropriate confirmations, you should see that your Bitcoin balance has now been updated to reflect however much you sent from the third party wallet. In both instances, you’ll be able to purchase Tron within the next steps; the main takeaway from this step is that we want to fund our account either by a direct BTC deposit or credit card purchase. Clicking on this will load up the Tron price chart relative to Bitcoin. What we need to do now is buy TRX from the cryptocurrency markets as provided by Binance. In order to do this, we’ll simply need to scroll down on the new page we’ve just loaded up and find the ‘Buy TRX’ square. Underneath, you’ll see the choices ‘Market’ or ‘Limit’ order. We’re going to place a market order, which is just an order type that executes at the next best available price. 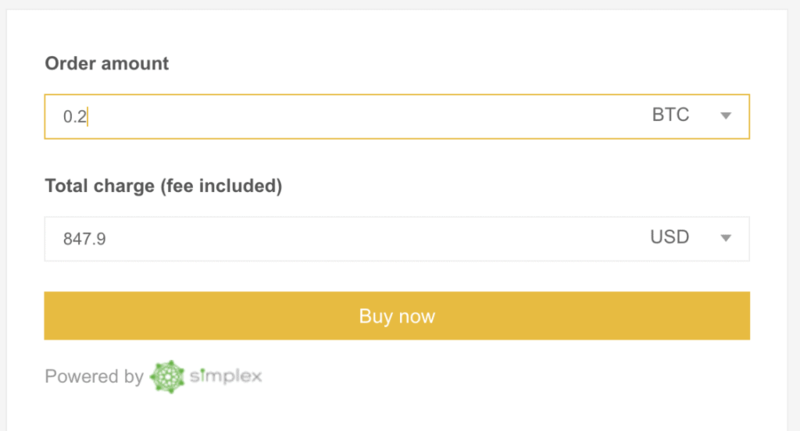 All we’ll need to do in the input fields is specify how many TRX we want to purchase (You can use the inclusive tool to calculate how much you can afford with your Bitcoin, you can press the ‘100%’ button as indicated in the image which will spend all your Bitcoin on buying TRX at the next available price. After you’ve specified how much TRX you want to buy, press ‘Buy TRX’ and wait for order execution (Usually instant) – once completed and processed, check your new Tron (TRX) balance and you’ll see you’ve successfully bought Tron. Coinbase is a San Francisco headquartered cryptocurrency exchange, cryptocurrency retail service provider, and privately held company that is best known for its emphasis on regulation and compliance. Coinbase currently does not enable direct purchase of Tron at this moment, however, you can purchase Bitcoin through Coinbase and then transfer it to Binance or another TRX supported exchange if you’d like. To do that, all you’ll need to do is create an account, link a valid deposit method, and then go to ‘Buy’ and find Bitcoin. Purchase your Bitcoin and then press the ‘Withdraw’ button and input the deposit address for another exchange that supports Bitcoin purchases. The idea of Tron getting listed on Coinbase is absolutely possible. Coinbase has maintained its stance that it will only list assets that are validated and are seemingly compliant under the United States legal framework, and Tron has hired multiple former SEC litigators and legal consultants to attempt to partake in the global currencies market. Although not currently listed on Coinbase, be wary of those who claim they know how to get Tron directly off Coinbase, as these could be potential scammers and are best to be avoided. Always check the official Coinbase website and their official support team if you have questions about their listed assets. Plus500 is a financial services firm and exchange that offers the purchase and sale of a variety of different assets including equities, indices, foreign currencies, and more recently: cryptocurrencies. You can trade Tron CFDs on Plus500. As we mentioned before, CFDs are contracts that are representative of the price of the underlying asset but do not equal the purchase of the underlying asset. This is paired with margin to either realize a gain or a loss faster than if you were to use your own capital. Traders use CFDs for a variety of reasons – with Tron CFDs if your sole purpose from purchasing it for an expected price increase, than CFDs are probably the better option for you. Plus500 is one of the exchanges that offer this to customers around the world. Purchasing Tron on Plus500 is fairly straightforward. Before we begin, you’ll need a valid funding method, documentation to provide for account verification, and a computer (Registration is fairly difficult via mobile at the moment). If you’ve pulled up all of the mentioned requirements, we can get started. Plus500 requires a preliminary registration in order to get started. For this, you’ll need to first head to the homepage of Plus500 and navigate to the top right of the navigation bar and click on ‘Start Trading’. This will prompt a new page where you’ll be asked to open up either a Real Account or a Demo Account. For actually purchasing Tron, we’ll need to select on Real Account, however, if you want to get the hang of trading or the platform without having to provide verification-related information, you can do so by opting for a demo account. Click on ‘Real’ and it will ask for your email as well as a password. Make sure both of these are valid, and go to your email – here you’ll have a verification link that you’ll need to click on to verify it. Then, you’ll be able to move forward. If done correctly, Plus500 will grant you with a preliminary account. You can look around and access some of their inclusive platform tools, but if you want to purchase Tron, you won’t be able to. Plus500 is a regulated/registered financial firm which means you need to submit an ‘Investor Profile’ for approval – your application will just consist of some documents that are held secretly by the platform’s team, but are looked over for approval. Keep in mind, Plus500 has an official guide on verifying your profile which can be found here – it also answers questions that To start the verification process, login to your account and on the main portal click on ‘Account’. Selecting this will prompt you with a button that asks you to ‘Verify Your Profile’ – selecting this will enable you to submit a few documents that are needed for a full verification of your profile. Valid payment method (You must link a valid form of payment for deposit from any of the approved Plus500 deposit methods. Second form of authentication – this can be a phone number an alternative email, etc. Providing these will then enable you to advance to the next steps, which is funding your Plus500 account to buy Tron CFDs. The next step is moving funds from your bank account, PayPal, credit card, or approved funding method to Plus500 so that you can use them to purchase Tron CFDs. To do this, start by navigating to your account portal and on the left-hand side clicking on ‘Funds’. Then, on this tab, you’ll be asked to click on PayPal, Bank Transfer, or Credit Card. Click on which one you’d like to add, and follow the instructions as given to you by Plus500 (Each individual deposit will differ and may have a different process). The fastest method in this case would be to utilize PayPal. To do this, select PayPal from the tabs as shown above, and it will ask you to link your PayPal account by logging in on the new window that pops up. Validate everything is correct, and then you’ll be able to deposit funds. We recommend beginning with $250 as a preliminary starting point. Wait for the transaction to process, and upon completion, you should see your funds have updated to reflect your deposit. 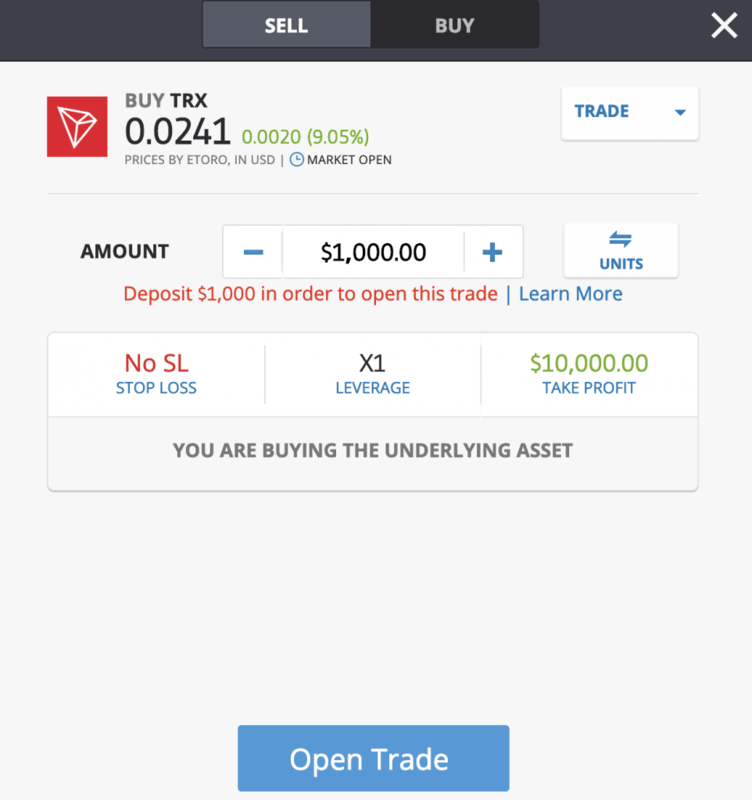 On this page, you’re able to buy and sell Tron in the form of CFDs and edit the amount of margin you want to utilize. This is the current best ask and bid price available on the exchange. As a result, enter in the amount of clicking on ‘Buy’ will prompt your order (Assuming your funds are sufficient) to be sent to the markets. Upon execution, you’ll then be able to track your purchase of Tron by clicking on the trading portal tab of ‘Open Positions’. From this section your able to set stop losses and take profits as well. Congratulations – you’ve successfully purchased Tron on Plus500! Those in the UK will find that there are very limited restrictions, if any at all, for purchasing Tron. 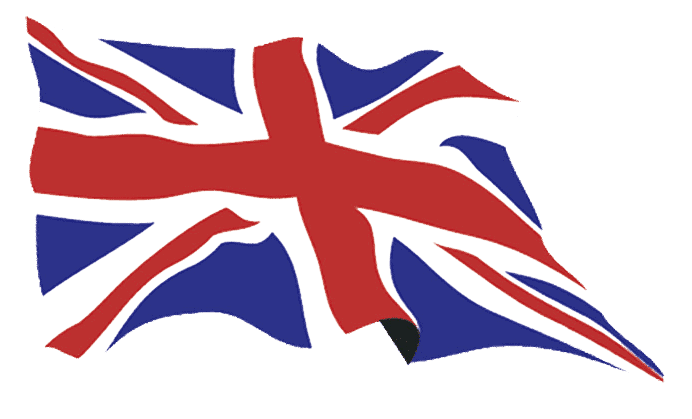 UK residents have a few options if they’re looking to purchase Tron (TRX). If you want to purchase Tron as the underlying asset (Buying, not selling) you can utilize eToro as well as Binance. eToro offers a hybrid financial product offering in that they offer the purchase of CFDs for Tron as well as actual purchases for Tron. eToro is also regulated and registered by the FCA and CySEC, which offers a significant level of security with your account as far as fund security and account safety. 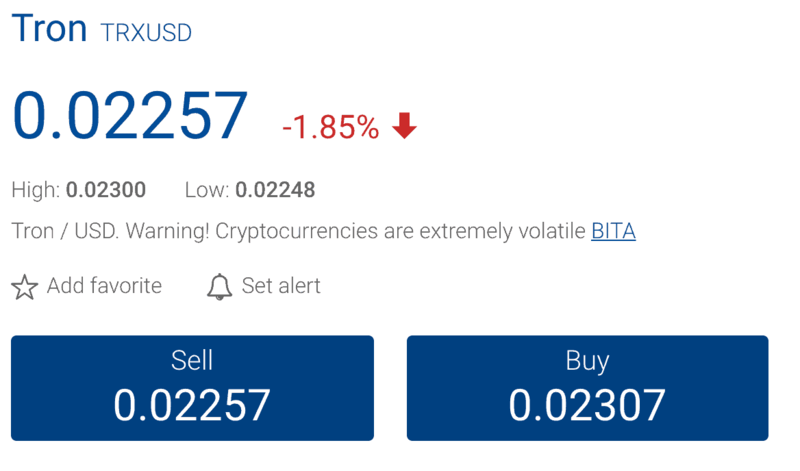 Tron can be purchased in Australia fairly quickly through eToro if you’re looking to purchase the underlying asset, and with Plus500 if you’re looking to purchase Tron CFDs (Tron contracts). Binance can also be utilized, however, Plus500 and eToro are both regulated and registered financial firms, and in accordance with Australia’s overall laws as far as financial services firms, it may be best to start out with one of the aforementioned if you’re a beginner with Tron. 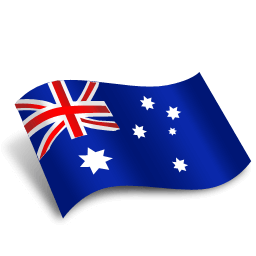 While eToro does offer CFD trading of Tron in Australia, Plus500 has tailored certain features for Australian residents, so this can be a great positive factor. When Tron is bought, you can send it to any other Tron wallet around the world, since you’re in control of the actual currency and not just its price representation. Trading Tron (Through contracts or most commonly through CFDs) does not expose you to Tron as an asset, rather just the contract that represents Tron price. How to trade Tron with a trading robot? You have the option to trade Tron with a trading robot if you’d like to, however, it is highly recommended you proceed with extreme caution if this is the method you’re looking to use. There are in fact legitimate trading robots that allow you to algorithmically trade Tron without manually inputting any market purchases or sales, but there are also a variety of scams and fake robots out there as well. In order to trade Tron using a trading robot, you first need to find a legitimate trading robot that enables you to select certain currency pairs. In these cases, all that you would do is select “TRX/BTC” or any other listed TRX trading pair that is available for automatic trading, and opt it for your trading. Keep in mind that with these sorts of platforms, many times you’re able to customize the type of strategy or parameters that are employed as far as what the automatic trading actually does. In these cases, you can indicate what the trading is based on and the ‘rules’ that the trading robots follow. Ensure that you adjust this as well to suit your Tron trading. The easiest way currently to buy Tron using a credit card is through Binance, which can be done very quickly. 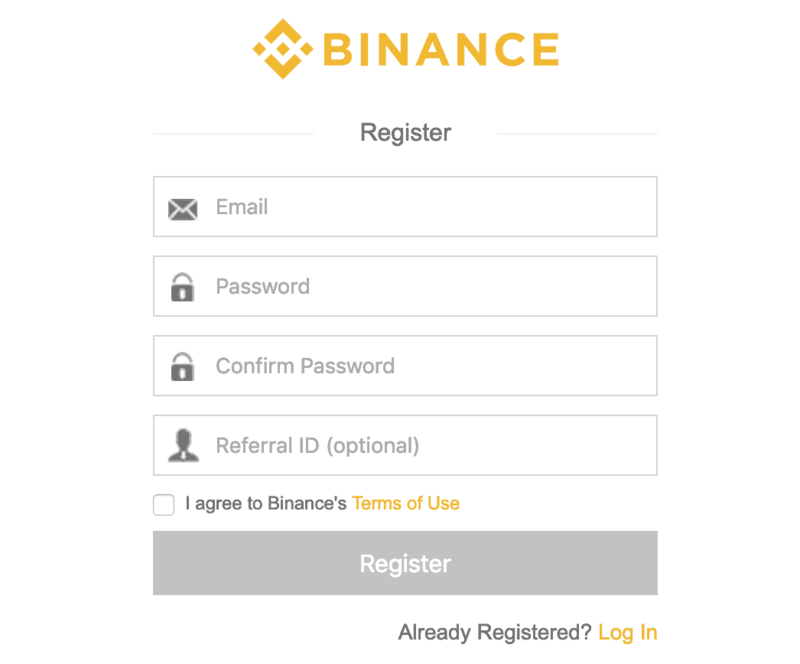 In order to do this, you’ll need to register for a Binance account (As we indicated and instructed above in the Exchanges section). Once registered, head over to the navigation bar on Binance (The top dark grey bar) and hover over the ‘Funds’ section. A list of options will then drop down, select the option at the bottom which says ‘Buy with Credit Card’. 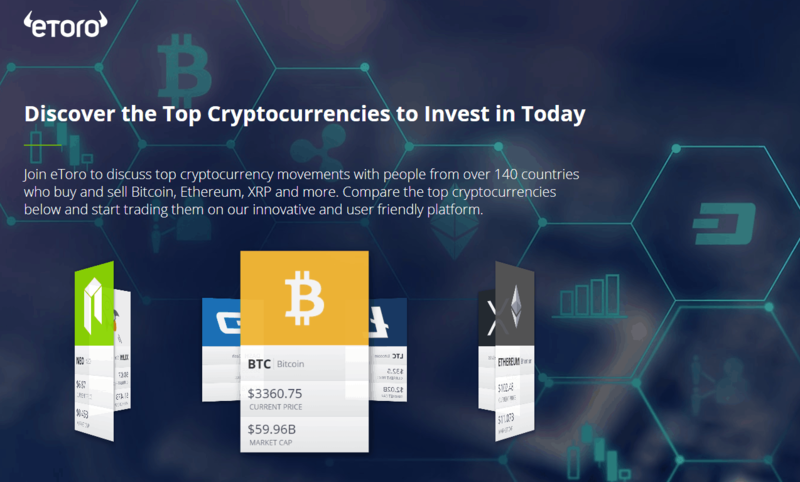 After selecting this option, you’ll be redirected to a new page where you’ll have the option to buy a variety of different ‘base’ cryptocurrencies (Cryptos that are paired as the base currency to other cryptocurrencies). Select either Bitcoin or Ethereum from the dropdown of this selection (As they are the most liquid options for purchasing Tron) and then enter in the quantity of funds that you want to spend for your purchase of Tron (We’re not buying Tron just yet, just the base crypto first). Then press ‘Buy’ and wait for the execution of the trade, and once this is done you will see that either Bitcoin or Ethereum (Whichever one you’ve chosen) will be updated in your account balance. Then, navigate to the markets the same way as instructed in our Binance portion of this guide, enter in the quantity of Tron you want to purchase, define either a market or limit order (We recommend market orders for absolute beginners to get their hands on Tron as fast as possible), and press ‘Buy TRX’. Upon execution, you should now have successfully purchased Tron using a credit card on Binance. Keep in mind, eToro and Plus500 also support credit card usage – eToro can be used for a purchase of actual TRX and TRX CFDs, whereas Plus500 can only be used for purchase of Tron CFDs. Using PayPal to purchase Tron can be done in 1 of 2 options (Depending on your jurisdiction as well as account type) – you can utilize eToro for a purchase of both Tron and Tron CFDs using PayPal, or you can utilize Plus500 for immediate Tron CFDs using PayPal. eToro enables you to buy Tron on their platform using PayPal, but there are a lot of jurisdiction restrictions, so it’s best to review those and assure you’re good to go prior to moving forward. In order to purchase Tron via PayPal on eToro, as instructed in the above eToro tutorial, go to ‘Deposit Funds’ and from the drop down that offers a selection of different deposit methods choose PayPal; it will ask you how much you would like to deposit as well as which currency. Enter in the appropriate parameters, and you’ll be able to then move forward. You’ll be asked to verify your account as well as confirm the transaction, and once the processing is complete, you’ll have successfully deposited funds from PayPal to eToro. The next step is manuevering to the ‘Trade Markets’ tab and finding Tron and specifying your amount type and order (See above for further instruction). Upon execution, you’ll have successfully purchased Tron using PayPal. You can use Bitcoin to purchase Tron by creating a Binance account and navigating to the ‘Funds’ tab and clicking ‘Deposits’ from the drop-down menu. On this menu, you’ll then be able to search for Bitcoin or ‘BTC’ and select it from the drop-down. Doing so will create a unique Bitcoin address; send your Bitcoin to this address, and after the proper amount of confirmations and processing, your deposited funds will be relative to your account balance. Once deposited, navigate to the markets by clicking ‘Exchange –> Basic’. Then, on the right-hand side, use the magnifying glass by the BTC markets section and search for ‘TRX”. 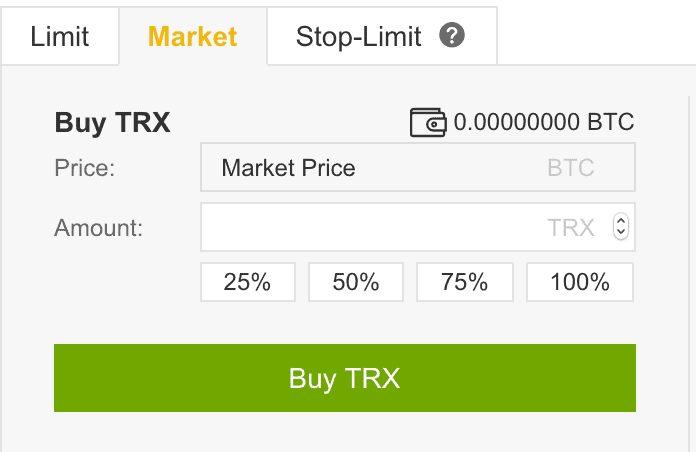 You should see TRX/BTC – go to ‘Buy TRX’ and use the slider to adjust how much of your funds’ worth you want to purchase. On execution, you’ll have bought TRX with Bitcoin. Let’s say you’ve successfully purchased Tron, and now after a few months of holding, you want to sell this said Tron. You can do so by navigating to any Tron supported exchange listing and finding the account deposits section, searching for ‘TRX” and then clicking on deposit. As a result, a new deposit address will be generated for you; send your Tron from wherever you’re holding the Tron (Assuming you’re not holding it on the same exchange that you’re selling on – either way will work). Once successfully confirmed to the max extent, you’ll then be able to finally sell your Tron. Doing so will allow you to choose between either a market or limit order (We suggest market order which simply executes at the next best possible price), and then the quantity for the TRX that you’re selling. Enter in however much you want to sell, then press ‘Trade” highlighted in blue. Upon execution, you’ll have successfully sold Tron. You’ve just learned how to buy Tron, how to buy it on different exchanges, how to buy a Tron CFD, as well as the ins and outs of what Tron is and how it can be used in your cryptocurrency and blockchain portfolio. Our top pick amongst best services to purchase Tron on is eToro. eToro is regulated and registered with the FCA and CySEC, so it maintains a level of security and safety that not many other exchanges are able to offer as far as account insurance and fund protection. It also allows for purchase of Tron and Tron CFDs. If you like to receive articles like this into your inbox along with Tron news, be sure to subscribe to our newsletter. What's the difference between Bitcoin and Tron? Tron and Bitcoin are both cryptocurrencies that run on a blockchain, however, their technological structure and fundamental purpose are quite different. Bitcoin is aimed at being a decentralized and instant form of payment for users around the world. While Tron encompasses a similar concept, there is an additional layer to Tron that enables the development and utilization of decentralized applications, programs that are built on the blockchain. Additionally, Bitcoin maintains a lower throughput as far as transactions per second while Tron maintains a very high amount (This means Tron is faster than Bitcoin) – however Bitcoin is arguably more decentralized than Tron. Each has their prospective positives and negatives. Justin Sun is the CEO and founder of Tron (TRX). He worked at Ripple (XRP) before branching off and creating his own cryptocurrency. The cryptocurrency was launched in 2017 after a successful ICO. Is Tron Legal In My Jurisdiction? Jurisdiction-based legislation is consistently changing, especially with cryptocurrencies and blockchain technology. It’s best to check with valid sources to see if Tron is restricted in your area. In most major areas, tron is currently legal. Can Tron Make Me Rich? In 2017 leading to 2018, Tron made thousands of people ‘rich’, because of its almost unbelievable price rise. Tron went from its ICO price (Which was below $0.01) to over $.27 in the course of just a few months. This was one of the fastest price rises in an asset and demonstrates that although the rise was short-lived, Tron has in fact made people rich before. Prior performance doesn’t indicate future results, however, if you bought in at ICO time (Which was in 2017), by 2019, you are still up over 400% on your investment which is quite impressive. Is Tron a Good Long Term Investment? Tron is interesting in their long term model in that they are not like most other cryptocurrency or blockchain projects that plan milestones and roadmaps for a few months to years ahead; their roadmap consists of nearly decade long ‘Phases’. This means that Tron aims at improving the online market for digital currencies throughout the course of multiple decades; arugably, this makes it more focused on long term growth than short term. 3 (Step by Step) How to buy Tron on eToro? 6 How to trade Tron with a trading robot? 8 How to sell Tron? Can Tron and Eos effect the market share of Ethereum ? Is buying TRX better through a bank account or with a credit card? Which way is easier and faster? Please answer asap.